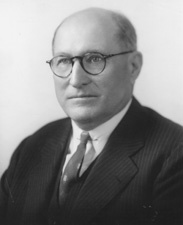 THOMAS, John, a Senator from Idaho; born on a farm in Phillips County, Kans., January 4, 1874; attended the rural schools and the Central Normal College at Great Bend, Kans. ; taught school, serving as superintendent of schools of Phillips County, Kans., 1898-1903; register of land office at Colby, Kans., 1906-1909; moved to Gooding, Idaho, in 1909; engaged in banking and livestock business; mayor of Gooding 1917-1919; member of the Republican National Committee 1925-1933; appointed on June 30, 1928, and subsequently elected on November 6, 1928, as a Republican to the United States Senate to fill the vacancy caused by the death of Frank R. Gooding and served from June 30, 1928, to March 3, 1933; unsuccessful candidate for reelection in 1932; chairman, Committee on Irrigation and Reclamation (Seventy-first and Seventy-second Congresses); resumed former business pursuits; again appointed on January 27, 1940, and subsequently elected on November 5, 1940, to the United States Senate to fill the vacancy caused by the death of William E. Borah; reelected in 1942, and served from January 27, 1940, until his death in Washington, D.C., November 10, 1945; interment in Elmwood Cemetery, Gooding, Idaho. U.S. Congress. Memorial Services. 79th Cong., 2nd sess., 1946. Washington, D.C.: Government Printing Office, 1948.